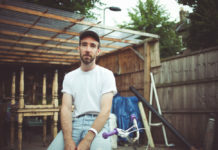 Earlier this year, Veronica Falls drummer and multi-instrumentalist Patrick Doyle released a brand new indiepop track titled ‘Poisonous’, marking the start of new project Boys Forever. Originally launching as a bedroom-based solo effort, Doyle claims that the ever-changing project has grown into a full live band, and last week saw the release of the project’s self-titled full-length. Living up to the band’s Pan-esque name, the record opens with first single ‘Poisonous’, boasting dreamy surf-rock grooves and pop-fuelled melodies, and providing the track with an upbeat tempo despite its darker lyrical content. ‘Falling Apart’ follows with infectious lyrics and a steady drum beat throughout. Failing the listener’s full attention however, the track begins to sound painfully similar to its predecessor, before single release ‘Voice In My Head’ takes over, treating the audience to an intriguing blend of indie rock vibes and psychedelic undertones. ‘I Don’t Remember Your Name’ jumps out with an emotive riff that you’d likely expect from an early 90s Cure record (when Robert Smith ditched the gloomy atmospheres somewhat), paving the way for the rest of the album. The track’s unmistakably carefree nature stands out dramatically, but it provides the listener with a pleasant break from the darker tones scattered throughout the album. Recent single ‘Cold Is The Colour’ comes next, reverting back to surf-rock grooves and marking an instant favourite for fans of The Replacements and Beach Slang, while ‘Things’ flaunts a resounding baseline that naturally highlights Doyle’s smooth vocal work. ‘Brian’ marks the most infectious track on the record, with a simplistic yet appealing repetitiveness, while ‘If You Don’t Mind’ subtly incorporates a more melodic sound towards the end of the record. While the emotive ‘I’ll Remember You’ combines heartfelt lyrics and dreamy pop melodies with vocal work reminiscent of Matt Pryor, album closer ‘Underground’ takes the form of a dance-fuelled surf number. 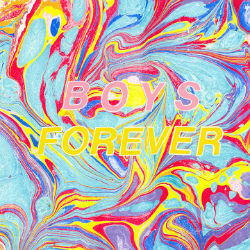 Boys Forever is a fascinating release that blends melancholic lyrics with a contradictory cheerfulness – certainly marking Patrick Doyle ‘one to watch’ in 2017.